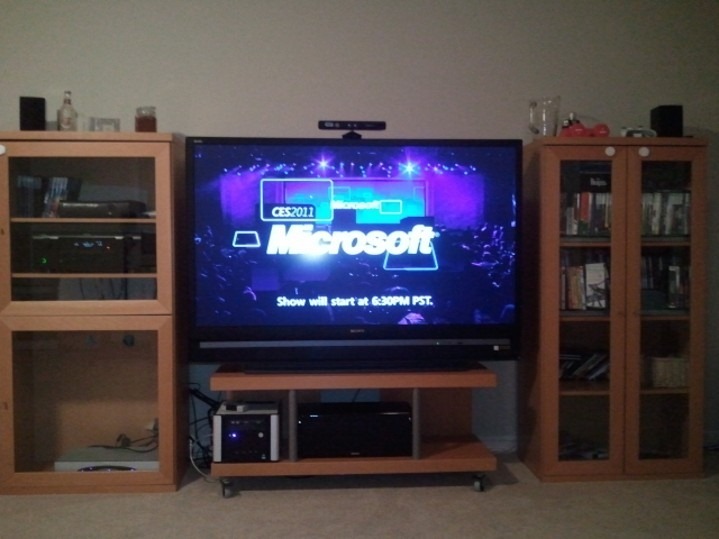 Back in ‘09 when Windows 7 was being tested, I built a custom Windows Media Center box for our home theater. The box needed to be quiet, compact, and rock-solid stable. I also wanted a solution that had multiple tuners and could support CableCard. In the ensuing two years, the little box (seen lower-left below the TV) has seen many updates, upgrades, and changes. I just looked at the reliability monitor and it was peaked out at “10” reliability for months. This wasn’t an accident so here are my tips & tricks for building a rock-solid Windows Media Center Home Theater PC. Visit TheGreenButton.com and learn. Learn from the community, read up on the latest news, software, hardware configurations. Use an Intel Processor. It doesn’t have to be the fastest. Mine is a dual-core E5200 that was going for $60 if you can find them online. For the best performance, I would go with a Core i5 so you have the headroom. Use an Intel Motherboard with integrated Video. There’s plenty of debate on this one however I’ve consistently found that a paired Intel Proc and Motherboard deliver a rock-solid solution. Get one with built-in video capabilities (a G45 chipset or greater), HDMI and S/PDIF Optical digital outputs. This will give you sufficient horsepower to do 1080p video with the latest drivers. For a while, the drivers weren’t mature enough and there were problems. I had a discrete half-height board in for a while but that also had some driver issues. Intel does a really good job of keeping on top of video quality-related driver fixes IMO. Use an Intel Solid State Drive (SSD) for your main drive. With no moving parts, completely silent performance that tears through data, this was the most expensive upgrade and most completely worth it. It truly turns Windows into a CE-class device on a performance basis. Use a BIG, high performance hard drive for your content storage and you’re set. Get a Ceton InfiniTV Tuner. This board is fantastic. I’ve used Silicon Dust and ATI tuners as well, but the Ceton board gives you 4 tuners and a fantastic set of tools for diagnostics. Really well engineered and supply chain issues are fixed with a slight revision to the board. It’s now available on Amazon.com. Get the latest INF and Drivers. Windows Update will do a great job getting you drivers, but start with the Intel INF and Chipset drivers, and set Microsoft Update to autopilot. Go direct with HDMI. The biggest issues I had were related to my Denon AVR which had some handshaking issues. It has problems with other components too so I plugged the HDMI cable into the TV, and the S/DIF cable (Toslink) into the receiver and it’s rock-solid. Don’t install beta. This is going to be hard. You will read on TheGreenButton about great software and you should download and install this, just not on your HTPC. Install it to your Windows 7 desktop and play with it there. I have a SiliconDust dual-QAM tuner in my network closet just for this reason. Don’t install 3rd Party Software. This is an intervention. Yes, this is going to be tough. Sure, there’s this amazing new codec that enables you to do Q, that new transcoding plug-in that does Z to remotely play to your yDevice. Very few of these apps are well built in my experience. The ones that have been around a while (e.g. MyMovies) should be fine, but the only add-on I have is Blu-Ray software (Cyberlink) which frankly still does a really poor job on user experience but reduces the number of components needed. Get a UPS. This was the only reason the little box has gone down. I had a bad battery in my Uninterruptable Power Supply which knocked my reliability down in pesky power outages. Hope that helps. Feel free to share your configuration, tips or tricks too!